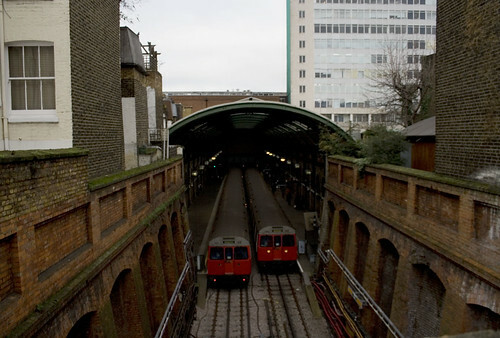 This coming Sunday, London Underground will send a steam train along the original Metropolitan Line and parts of the District Line – so I wandered out to check where the best places will be to watch it. At the time of writing, there is no formal policy from up-high to the station staff about how to handle spectators at the stations themselves – it seems to be left to the individual stations to manage using their standard crowd control procedures. So – photography within stations means no flash and no tripods. It also means no loitering, which could be problematic. Do you arrive just before the steam train so as to not loiter on the platform, only to find it is ram-packed full of people, or do you try to turn up early and bag a good spot? From a “size of crowd” perspective, I think that Earl’s Court station could be the best thanks to its two footbridges over the tracks, and the high-level walkway above one platform. 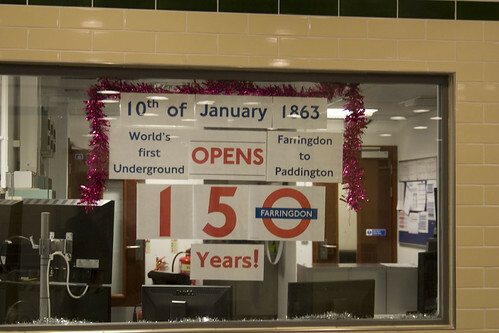 Farringdon is also another option thanks to another footbridge and plenty of space on the platforms. The other stations might be just too crowded to risk. So, where else along the line can you get photos from? 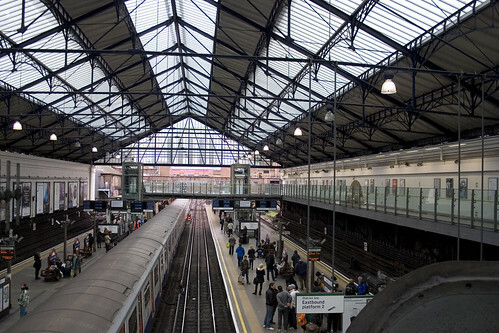 The steam train runs between Moorgate and Kensington Olympia, with some shorter trips turning around at stations along the route. What it important to note is which direction the train is travelling when under steam power, as sometimes it travels “backwards” with the electric locomotive at the back of the train pulling it. That will affect which way you face if you want photos of the steam locomotive. 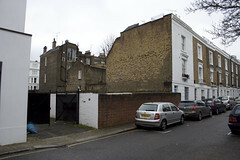 Note – many of the street locations are looking over walls and need a small step-ladder. I use a light three-step ladder which was fine for all sites. Edit 15th Jan – times have changed from original timetable and a lot more trains are running. Thanks Chris! There are quite a few platforms, but I am assuming that the train will leave from the Earl’s Court facing platform closest to the Olympia building. The best views will be from the side road, where a wire fence slightly blocks the view, but most cameras can easily shoot through the gaps. You can also get a decent view if tall from the road bridge (A 315) over the tracks. Next to the road bridge on the eastern side is a very good vantage point to see the train and platform – but it is a small patch of space no more than 6-8 people wide. 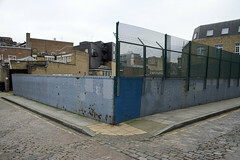 A trackside location exists on a side street, and while it has a high fence, it is thin enough to watch through, if probably not photograph unless you get really close. Note that the Overland tracks are between you and the steam train – very unfortunate timing could mean the view being obscured. 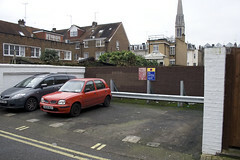 Almost certainly the best photo location though is next door, at the Tesco superstore car park. This sits facing the tracks to the north, and also has fairly decent views to the south. A phone call to the store and a duty-manager told me that it wouldn’t be a problem for pedestrians to use the car park at that time of night – so long as people aren’t loitering around for hours. Access is via a grand set of stairs at the front of the store. Just around the corner is the A4 West Cromwell Road. The bridge over the railway has walls that most people will be able to peer over without difficulty. The main problem is that the pavement is quite narrow and as the road is very busy I would strongly recommend not blocking the pavement here if you can go to Tesco instead. Apart from the platforms, there will be good vantage points along the over-head walkway and the bridge to the lifts. There is also viewing options in the corridor leaving to the exhibition centre and the overbridge linking the platforms there – but you will be watching through reinforced glass windows in those locations. Within the station limited viewing options save maybe at the very ends of the platforms as it is a busy station and quite small. I would avoid frankly. There is a viewing area behind the station though – and while the fence makes it difficult for big cameras to get photos, small cameras should be fine. There are limited views from Campden Street – but obscured by steel retaining bars – and you need a step ladder to see over the wall. 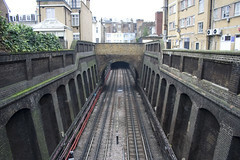 One potentially excellent vantage point with a step ladder — and probably only on the last trip on the 2nd Sunday when the steam train is facing westwards — is on Kensington Place just behind Notting Hill Gate station with a view direct into the station. Apart from within the station which is fairly spacious, there are two locations just behind it which offer good vantage points. 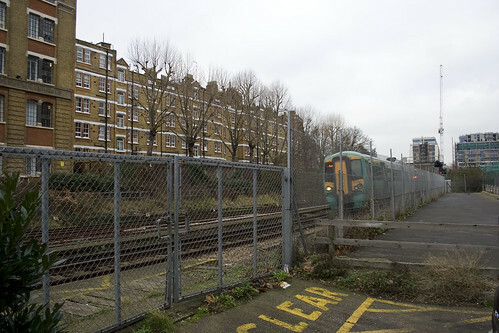 Right behind the station is Poplar Place, which has a small TfL staff car park, and behind the cars is enough space for a step-ladder to peer over the wall. Further along is Bark Place, another nicely quiet side street where a step-ladder shouldn’t cause inconvenience to other people. 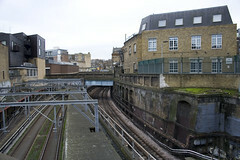 The last option on this side of the route before it goes entirely underground is also quite famous in tube-lore. This is another step-ladder required opportunity that can be found on Porchester Terrace. The view is obscured by steel supporting beams, but it is also the back of the famous fake-buildings on Leinster Terrace, so historically apt for photos of a steam train. 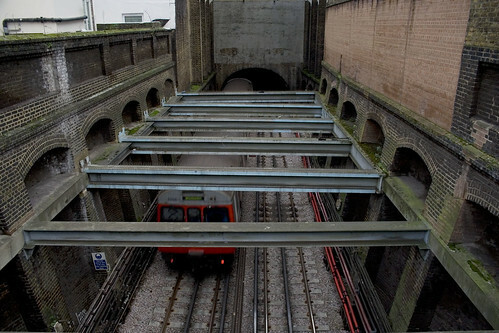 This is underground all the way – with the exception of Edgware Road, where photos from the overhead footbridge could be an option. It is however a busy interchange now, so might be best to avoid that one. I suspect most people will want photos at Baker Street, but Gt Portland Street is aesthetically not that different. Euston Square is ugly, and quiet, so might be good choice to avoid the worst of the crowds! The line runs mainly in open-air cuttings along here, so while some of them are messed up with steel supports, and you are photographing down fairly deeply, the brick arches help make photos interesting. All the venues along this route needed a step ladder. There is a limited vantage point at St Chads facing east only as most of the views are obscured by fencing around the walls. 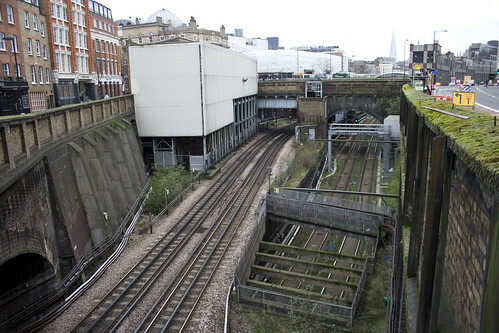 Around the corner is Leeke Street, which has very good views both east and west – although the remains of the old King’s Cross Thameslink station are either a bonus or curse depending on your aesthetic opinion. Views from Britannia St.; Wicklow St.; and Swinton St. are tolerable, but somewhat obscured by steel reinforcements. Britannia Street is the better of the three as it has clear views on one side – facing westwards. There is a clear spot on Acton Street, but it is very small, so probably not any good for photography. Further down is Ray Street, which offers very good views facing east and has a decent amount of pavement so step-ladders shouldn’t be a nuisance. That is if they remove the dead xmas trees by then! 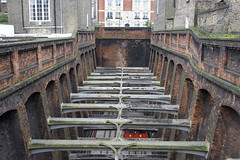 Behind Farringdon Station is Clerkenwell Road, which is a bit busy for loitering around with step-ladders, and a new footbridge somewhat limits photos, but if needs must, then it is an option. This has the advantage of a new footbridge over the tracks – so while you are watching through glass, it is a good vantage point. And they are getting into the spirit of things. Another through-glass option is the ticket hall of the new Thameslink/Crossrail building on the other side of the road which has a very good view of the tracks leading from Barbican. No opportunities outside stations for watching, so options will be limited to at the stations themselves. Barbican is fairly quiet as a station, so could be a good choice. I expect Moorgate, as the destination station will be packed – not just with bystanders, but obviously the lucky passengers who were on the steam train wanting to get their own photos taken. So that’s my tips for places to watch. Away from the stations, I think the Tesco car park, Leeke Street, Ray Street and behind Bayswater offer the best alternative vantage points. The decorators have been in at Moorgate and have put up a nice display up on the unused Thameslink platform (platform 6). It’s vaguely possible they’ll open that up for people wanting to do photographs, but that would only work if they use platform 4 for the train. But that’s all “could do” rather than “will do”. But it would certainly make sense from the station crowd control point of view. Outstanding work Ian. Thank you. Ahh thanks, wasn’t aware of that one. Will be a better one to photograph as well, thanks to being in daylight! I would advise people to avoid Moorgate completely, unless they are travelling to take a seat on the train. Arrangements appear to be similar to September’s A-Stock tour in departing from Moorgate, with the third entrance for ticket holders only – but it should be noted that photo ops will be exceedingly limited for passengers not travelling on the train. It would be much better to go elsewhere, as this excellent article highlights! I agree, it seems an S7 will be specifically stabled in the adjacent bay platform to screen the steam service from the rest of the station. Thank you Ian. I was using Google Earth to spot good places to see the train but this is so much better! Thorough research here. Many thanks. Pity the majority of excursions are after nightfall. Are the trains likely to kept at the termini between runs? There would be quite few hours during the day on the 13th Jan.
Super informative blog post! Can’t wait for this event. Choo choo! As I noted – the store’s duty manager has no problems with people “at that time of night” using the car park. The car park doesn’t close. I am slightly frustrated about this whole thing, as I did get selected for tickets in the ballot, but couldn’t find anyone else willing to pay the £150 price (the most expensive ticket on the tube ever?!) and come with me. So thanks, Ian for posting this, the next best thing for me will be to see the train on a platform somewhere, fingers crossed it won’t be too busy! Surely they aren’t going to Kensington High Street and back out again instead of just taking the Cromwell Curve/triangle direct from Earls Court to Notting Hill Gate? That would put the wrong end first as well. All the trains are going direct between Earl’s Court and High Street Kensington, apart from one i believe which heads east along the district before reversing – this is so the trains terminating at Baker St have the steam loco at the west end. Thank you Ian, for all your research. Members of Wimborne Railway Society are thinking of coming to London to photograph the specials, either on 13th or 20th, perhaps with a trip on the new Overground ‘outer circle’ too. Your advice is great. Do we know the definite start place for the staff train at 9:55 on Sunday yet? If it is starting at Olympia, Tesco looks a good bet. However if from EC – that won’t be any good. My understanding is that at this point in time, the train will leave Lillie Bridge Depot at 9:40 for Kensington Olympia pulled by Sarah Siddons, arriving 6 minutes later. It then departs under steam at 09:55. I just put the note there following a couple of comments which hinted that the Ken Olympia bit might not happen, but then again they have to pick up passengers somewhere. I believe the first train on the 20th runs to Gloucester Road to reverse. Thank you Ian for the painstaking research, saw the steam train go through Earls Court bang on time today! What a sight. Thanks so much for posting this – super helpful. Just seen the steam train leave Kensington Olympia. Followed your advice & went to the side road by the track – got a great view! Apart from that frame I do have additional frames with the train in alternate positions. There’s a steam-hauled trip on 20 January which isn’t listed; perhaps it’s for staff / invited guests only? ‘Journey 8’ will leave Moorgate Platform 4 at 1915, travelling to Edgware Road where it will stop briefly to reverse, arriving back at Moorgate at 1952. Thanks so much for this brilliantly detailed guide. I used it to plan a trip with my kids ( though I also got a nice picture) and am very grateful that you made that possible. Thank you so much,Ian.I picked up on your blog in this weeks` Time Out.I missed going to photograph at Ken.Olympia last Sunday due to a personal problem so I hope to be at EC for the 6.23p.m. train. For those who had planned to catch a bus from West Ken.station having travelled on the District Line from EC,there is an engineering possession from West Ken. westwards on the 20th. Thanks for all the info. Any idea on when and how the steam train gets back to Moorgate on 20/1. Also any idea of the time-table for the overground part of the LU 150 plan. The timetable for the 20th is at the top of the blog post – the runs later in the year are still to be announced. Thanks for a great feature. A quick question…my dad and me are lucky enough to have tickets for the evening of 20/1. Has anyone been on the steam trip? Does anyone know if there are photo ops built into the itinery? It doesn’t look like it from the programme, but it would seem mad not to give people a chance of a shot in the underground with the engine? Thanks so much for this information Ian – extremely useful! Thanks for putting this together. It was really useful last night. 3 Pings/Trackbacks for "Best places to photograph London Underground’s heritage steam train trips"